For many years I have played games, more that I would like to count! During these years I have played many wargames of one variety or another. While I have played a modicum of miniatures games (historical and fantasy), I have enjoyed hex-and-counter historical games most of all. In all my years of gaming, I have filled many roles, from mere player, to playtester and now I have the good fortune (or I am very unfortunate) to now add the job of developer to my toolbox. Imagine my surprise, while at a luncheon with Richard Berg yesterday, when he asked if I would like to be the developer for an upcoming title in an existing game series. For those that don’t know, Richard has developed countless games on more subjects that would see possible. 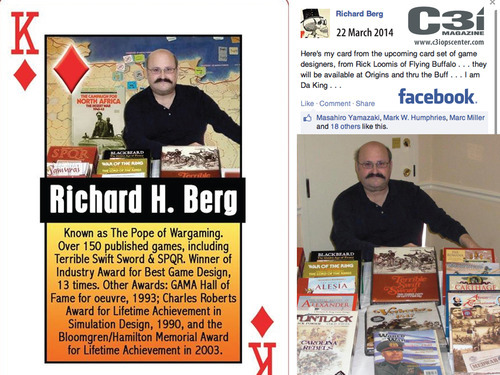 He has designed many, and mean many, wargames and designer games in his career. He is affectionately referred to as the “Pope of wargaming”. Please, don’t confuse a developer with being a game designer, they are two separate, yet complimentary roles in the overall game creation process. I am still working out some of the logistical details and once they are settled and ironed out I will announce the name of the series and subject matter of the game. I will also be looking for playtestesters that will really dig into the weeds to help refine the rules to make the resulting game as great as it can be. So, stay tuned for more details.